A lot of the good things about All Around Us start from the bottom and work their way up. 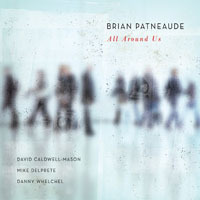 Saxophonist Brian Patneaude's compositions are a sturdy, coherent lot; they're also rife with odd time signatures, changing tempos, and an amalgam of Latin, funk, and jazz elements. The tunes are a virtual playground for bassist Mike DelPrete and drummer/percussionist Danny Whelchel, who, along with pianist David Caldwell-Mason, comprise the ideal rhythm section for Patneaude's designs. With one foot firmly lodged in the trenches and the other itching to shake loose and run free, they make things happen beneath the smooth, relatively unruffled sound of the leader's tenor. "Too Vast For Malice" is built on an odd meter Latin vamp, offset by a whirling, funky bridge. Whelchel's hand percussion and drum set rhythms complement Delprete's solo. The nimble Latin funk of "Orb" simmers beneath the leader's pensive treatment of the melody, and eventually the composition evolves into 5/4 time. 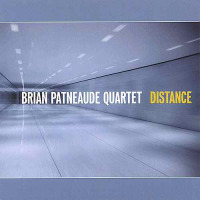 As Patneaude's solo turns insistent, he's matched by Whelchel's snare drum accents. "Double Trio" offers two varieties of funk beats before the band neatly darts into straight jazz time. After the out head, Whelchel deftly shadow boxes with the tune's bridge. Wayne Shorter's "Juju" begins with Patneaude's solemn solo introduction, which leads to the band's tantalizingly slow journey to the song. Later on, Patneaude and the band quickly build to a roaring climax. "Blucocele," the disc's finest track, is comprised of Patneaude's live-wire melody, played once with a hard funk bottom, and then a second time, underpinned by straight-ahead swing. Whelchel's backbeat variations, at once firm and agile, provide an ideal foundation for the leader's sweeping, effusive solo which contains a host of R&B references and crafty, cutting lines. At first Caldwell-Mason seems far removed from Delpete's walking bass. His solo gradually takes shape, connects to the bass and drums and gathers momentum as brief, prickly single notes lines stand alone and are punctuated by weighty chords. A host of attractive compositions, tight, witty group rapport, and solid solos combine to make All Around Us an interesting and enjoyable recording. Track Listing: Lake Timeless; Too Vast for Malice; Orb; Double Trio; Juju; Aimless Antithesis; Invitation; Blucocele. 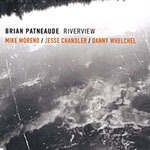 Personnel: Brian Patneaude: tenor saxophone;David Caldwell-Mason: piano, Fender Rhodes; Mike DelPrete: bass; Danny Whelchel: drums.